Poly tanks or vertical plastic water tanks from GEI Works can be a multi-purpose fire suppression tool for rural and residential homeowners, and commercial professionals. 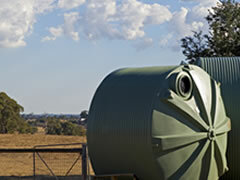 Constructed from FDA-compliant polyethylene resin and treated with a UV stabilized coating, these plastic storage tanks are prepared to store potable and non-potable drinking water while being utilized in open-air environments with intense sunlight for extended timeframes with little damage and break down of the tank. Although the polyethylene storage tanks from GEI Works are optimized for potable drinking water collected from rainfall or through other means, they can excel with fire fighting in remote locations when other forms of fire suppressants are not available. In addition, the water contained within a polytank can serve multiple purposes such as agricultural use, livestock, in-home use, and industrial applications. Specifically designed for bulk storage of drinking water, GEI Works Vertical Poly Tank should not be used for storing hazardous or toxic materials, including non-liquids. Available volume selections for liquid poly containment units range from 305 to 10,000 gallons, with custom specifications available on request. Vertical Poly Water Tanks from GEI Works come with a choice of dark green or black coloration to the polyethylene resin. These colors are designed to keep light out of the tank to reduce the growth of algae on the interior of the water storage container. 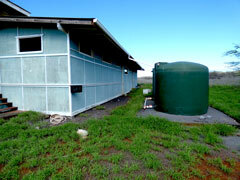 Bulk water storage has a variety of benefits to a rural, residential, or commercial owner. There are occasions when firefighters cannot reach your location or there is a lack of available water for fire suppression purposes, so the availability of a Vertical Poly Tank can be an investment that pays for itself. Furthermore, a water storage container like this has the capability of retaining rainwater or having water pumped in to maintain its reservoir. 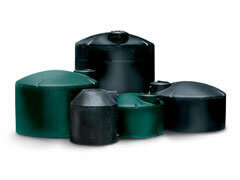 From there, you can use it as a replenishable water storage tank for fire protection on your jobsite, farm, or ranch. While firefighting water does not need to be safe to drink, these polytanks can be used to store potable water. Additionally, these polyethylene storage tanks are impact resistant, UV resistant, emergency-ready and algae resistant to assure clean drinking water for an indefinite length of time. Call us for details on fittings and manways at 772-646-0597 today! If you have questions about our Vertical Poly Tanks, feel free to request a quote below.